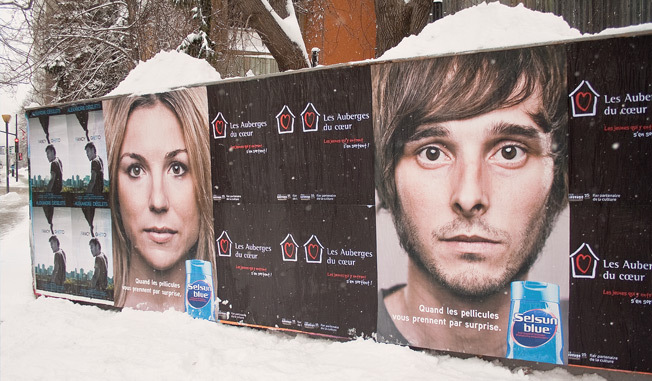 Montreal agency lg2 found a goofy but practical use for all the snow this winter—it made it look like dandruff gone berkserk on outdoor ads for Selsun Blue. Pity the fool who had shoveling duty on this project, though. "Dandruff flakes typically occur in winter," the agency says, "due to the use of heating sources such as electricity. Selsun Blue and lg2 thus decided to launch an offensive at a time when people are most in need of dandruff-fighting shampoo." The headline, "Quand les pellicules vous prennent par surprise," translates to, "When flakes take you by surprise." Credits below.